On the 13th anniversary of the last Concorde flight, Boom Technology and Virgin Galactic want to start a commercial supersonic passenger jet service that will be faster than its older counterpart and cost no more than a business class ticket. At a Colorado aircraft hangar, the two firms unveiled the triple-engined XB-1 prototype, a one-third sized prototype of the airliner they hope will be able to blast from London to New York in three hours and 15 minutes – air traffic control allowing. "60 years after the dawn of the jet age, we're still flying at 1960s speeds," said Blake Scholl, chief executive officer and founder of Boom. "Concorde's designers didn't have the technology for affordable supersonic travel, but now we do. Today, we're proud to unveil our first aircraft as we look forward to first flight late next year." Boom, a product of the Y Combinator startup factory, claims that with advanced materials, more efficient engines that don't require an afterburner that chews fuel, and a more efficient wing design, it can make supersonic travel a commercial reality for the cost of today's business class – around $5,000 for a return transatlantic trip. 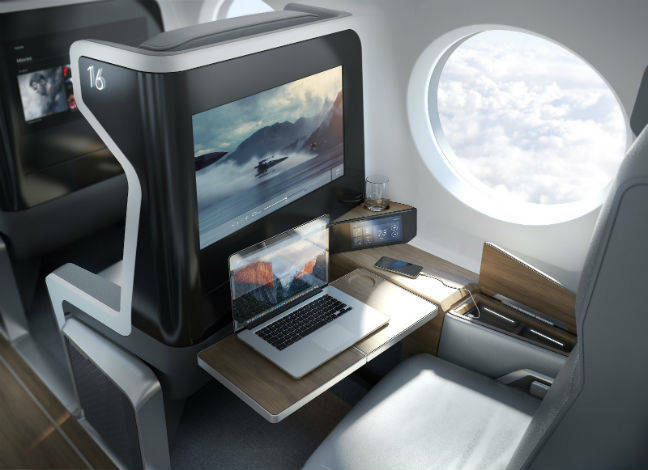 The firm envisages 170-foot long airliners with 60-foot wingspans that will seat 55 passengers, one on each side of the aisle. The finished craft will have a range of 4,500 nautical miles (long enough for New York or Washington to London), but Boom says it'll be designed for refueling for trips with twice that range. "The Boom airliner will be a core part of the intercontinental airline fleet," predicted aviation consultant Mike Boyd of Boyd Group International, at the XB-1 unveiling. "Travelers are hungry for faster flights and airlines will be excited for a differentiated and profitable option for their premium travelers." Possibly, but a lot depends on how the testing goes. The XB-1 will be tested in association with the Virgin Galactic team from next year and will be used to refine the airframe and engines that will be needed to make commercial supersonic flights a reality, and Branson's crew have already booked to buy the first 10 passenger aircraft. "I have long been passionate about aerospace innovation and the development of high-speed commercial flights," said Richard Branson, founder of Virgin Group. "As an innovator in the space, Virgin Galactic's decision to work with Boom was an easy one." Ever since it was first mooted, supersonic passenger flights have run into three problems: cost, complexity, and commercial regulations. The original Concorde was ludicrously expensive to fly on and maintain. If Boom is to get the price down as far as it promises then it might be possible to build a commercially viable service for some routes, but $5,000 for a transatlantic flight looks very ambitious. Complexity adds another layer of cost and hassle. The airframe demands of supersonic flight are heavy, with narrow delta wings for low resistance and stability at high speeds. The downside of this is the aircraft tends to be ungainly at lower speeds, such as landing, and designers have to take that into account. There's also the regulatory environment. Supersonic flights can't be carried out over land due to the noise Boom's business carrier generates, which limits the number of routes that can be run. But there's also takeoff noise, and the FAA has recently warned that it's going to be tightening up the restrictions of sound emissions during takeoff and landing. Boom's answer to this is its "proprietary variable geometry intake and exhaust," which can be adjusted to keep things quieter when necessary.